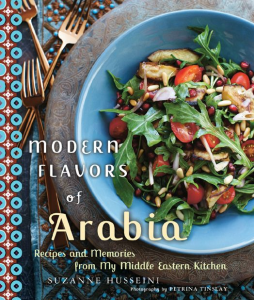 “Modern Flavors of Arabia” by Suzanne Husseini is a wonderful cookbook, chock full of easy to follow recipes that introduce you to the spices and the aromas you love about middle eastern food. Arabia generally refers to the regions of Eastern Mediterranean, North Africa and the Middle East. This cookbook has gone everywhere with me since I first received it one month ago. My goal was to master 4 new recipes, utilizing varying levels of skill and flavors. My first choice was hummus. Thanksgiving was coming, and I wanted to have appetizers that were healthy. You’ll want to try and add to your repertoire of recipes on hand to prepare for your family or guests. I have always wanted to improve my ability to work with spices such as nutmeg, coriander, cumin, turmeric, ginger, cinnamon, allspice, and sumac, but never really knew how. I immediately made hummus, Roasted Cauliflower with Citrus Tahini Sauce.